Hand etched and painted bottle featuring a Philadelphia Eagles Champions design. On February 4th, 2018, the Philadelphia Eagles defeated the New England Patriots 41-33 in Minneapolis to become World Champions. 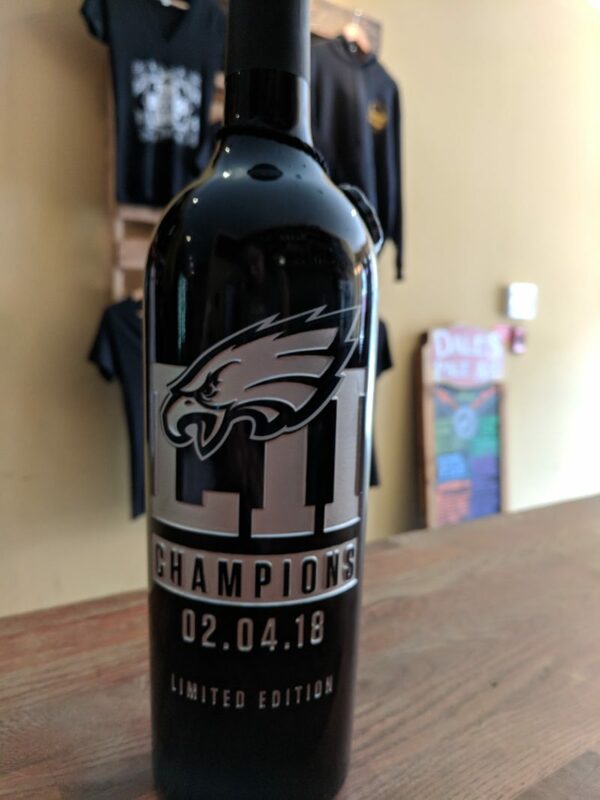 The Philadelphia Eagles and Mano’s Wine have partnered to create a line of limited edition wines to commemorate this historic feat. Enjoy responsibly and share with a fellow Eagles fan. Cheers! This Handcrafted Reserve is a happy marriage of Central Coast Cabernet Sauvignon and Monterey Merlot. Aged for 15 months in a combination of French and American Oak, this Bordeaux-style blend shows soft tannins, ripe cassis, chocolate and berry flavors. These flavors create a medium bodied, dry red with a smooth finish that is sure to leave your palate pleased.